Sculpt A Six Pack In 400 Reps A Week. It's one thing to have a 6-pack; it's another still to make it 3D. The 400-rep workout can help you do just that. When you think of bodybuilding and fitness in general what is the first thing to come to mind? For most people it is having the abs. The 6-pack is what all the guys visualize when it comes to losing fat or even building muscle. Having abs is supposed to be what attracts the ladies to those men who are among the gym&apos;s elite. Something else is common in bodybuilding circles seems to contradict this theory. Yes the 6-pack is about eating right and doing regular cardio exercise. However, aren&apos;t the abs muscles involved also? They are indeed. So if everyone wants to have that lean muscular physique that includes showing off those abs then how come no one seems to take ab training that seriously? Sure when you are designing your next training program you will "throw them in" with another muscle group once or twice a week so you aren&apos;t neglecting them completely. Doesn&apos;t it make sense that if you focused on your midsection the way you do the chest, back, arms, delts and legs that it would lead to better results? Hopefully now you will take ab training more seriously and as such, get on a good ab routine. Fortunately Bodybuilding.com has you covered with this plan that will help you develop the abdominals. This program includes performing 400 reps every week to ensure your abs are getting trained hard and proper. 400 reps may seem like a lot but it is going to take a lot of reps to blast the core the way it needs to be. And As Such, Get On A Good Ab Routine. If you are having any difficulty with these exercises you can look at them with photos and videos in the Bodybuilding.com Exercise Database! Kneel below a high pulley that contains a rope attachment. Grasp cable rope attachment and lower the rope until your hands are placed next to your face. Flex your hips slightly and allow the weight to hyperextend the lower back. This will be your starting position. With the hips stationary, flex the waist as you contract the abs so that the elbows travel towards the middle of the thighs. Exhale as you perform this portion of the movement and hold the contraction for a second. Slowly return to the starting position as you inhale. Click Here For A Video Demonstration Of Cable Crunch. Make sure that you keep constant tension on the abs throughout the movement. Do not choose a weight so heavy that the lower back handles the brunt of the work. This is about focusing on your abdominals. You are going to do 5 sets of 20 reps with 90 seconds rest in between each set. Move your legs up so that your thighs are perpendicular to the floor and feet are together and parallel to the floor. This is where you begin the movement. While inhaling, move your legs toward the torso as you roll your pelvis backward and you raise your hips off the floor. At the end of this movement your knees will be touching your chest. Hold the contraction for a second and move your legs back to the starting position while exhaling. Click Here For A Video Demonstration Of Reverse Crunch. You are going to perform 5 sets of 20 reps with 90 seconds rest in between each set. 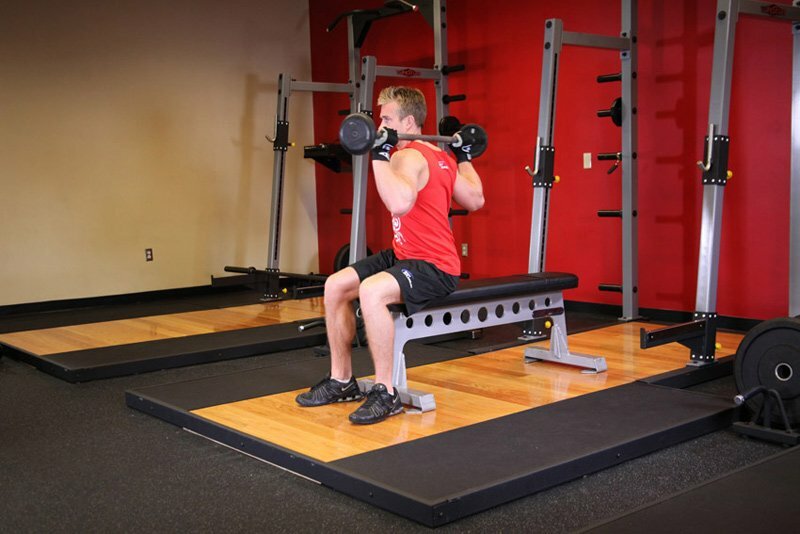 Start out by sitting at the end of a flat bench with a barbell placed on top of your thighs. If you don&apos;t have a small barbell around and you can&apos;t perform this with a regular barbell use a weighted bar from the aerobics room or a broomstick. Your feet should be shoulder width apart from each other. 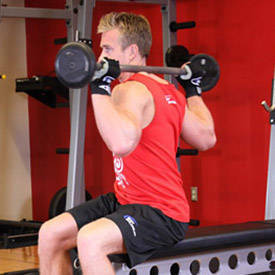 Grip the bar with your palms facing down and make sure your hands are wider than shoulder width apart from each other. Begin to lift the bar up over your head until your arms are fully extended. Now lower the barbell behind your head until it is resting along the base of your neck. This is the starting position. While keeping your feet and head stationary, move your waist from side to side so that your oblique muscles feel the contraction. Only move from side to side as far as your waist will allow you to go. Stretching or moving too far can cause an injury to occur. Use a slow and controlled motion. 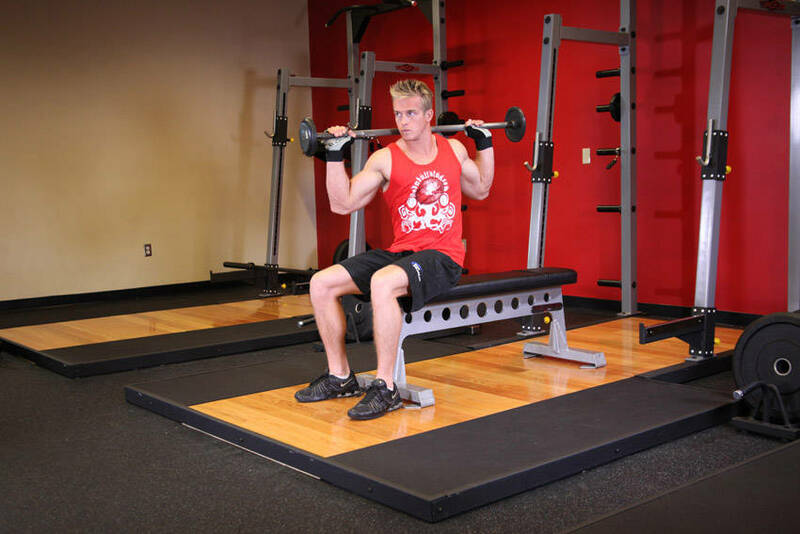 Click Here For A Video Demonstration Of Seated Barbell Twist. Remember to breathe out while twisting your body to the side and in when moving back to the starting position. You are going to do 5 sets of 40 reps each direction with 90 seconds rest in between each set. You will perform these at the end of the workout. To begin, stand straight with your feet shoulder width apart from each other. Place your hands on your hips. This is the starting position. Now slowly inhale as much air as possible and then start to exhale as much as possible while bringing your stomach in as much as possible and hold this position. Try to visualize your navel touching your backbone. One isometric contraction is around 20 seconds. During the 20 second hold, try to breathe normally. Then inhale and bring your stomach back to the starting position. Once you have practiced this exercise, try to perform this exercise for longer than 20 seconds. You can work your way up to 40-60 seconds. Rest for 30 seconds and repeat. Click Here For A Video Demonstration Of Stomach Vacuum. Do this three times and you are done. I know what you are thinking. "That is only 200 reps." The reason why it is a 400-rep plan is you are going to do this twice a week. Train abs with the first day of your week and at least 72 hours later. 200 reps times twice a week makes 400 reps total! If you want to really improve your focus on the abs then train them on their own day once a week. As long as you are following a good nutrition plan and performing cardio on a regular basis then you will see much more ab development within six to eight weeks with this plan. This is not going to be an easy routine, but stay motivated and focused on each rep and you will get that six pack that will impress everyone at your gym and will keep that pants size down to a number you won&apos;t be ashamed of.